"The Home of the Victrola"
Several years ago, I acquired two original, black and white photographs stamped "Pringle & Booth, 181 George St., Toronto", showing two large outdoor advertising structures manufactured by E.L. Ruddy, "the billboard king of Canada", who had set up a high quality billboard business in Toronto about 1900. 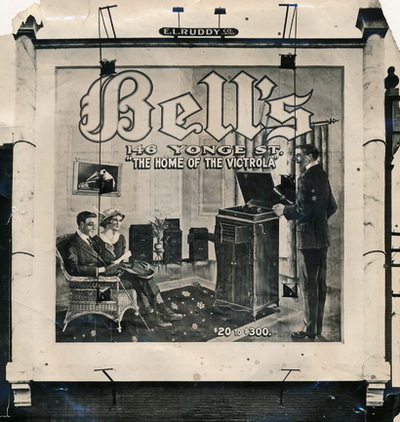 One billboard advertised Bell's, "The Home of the Victrola", $20 to $300; the other advertised Victor records at Bell's, "Over Thirty Thousand Records for all Makes Always in Stock". Both billboards included Bell's Toronto address, 146 Yonge Street. 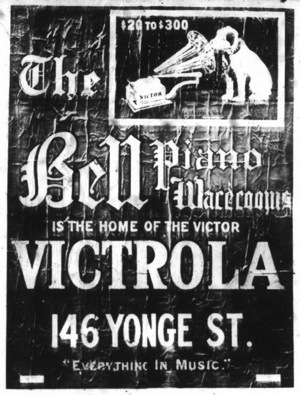 The Victor Records billboard also added a description, "The Bell Piano & Music Warerooms". 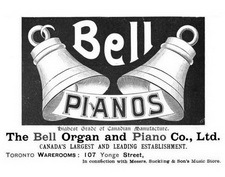 I was familiar with the name Bell's, which is the Bell Piano and Organ Co. Limited, of Guelph, Ontario, one of Canada's premier manufacturers and retailers of melodeons, reed organs and pianos from the mid-19th through the first quarter of the 20th century. I was intrigued to learn more about that company's involvement in the nascent gramophone industry and, especially, to document its Toronto location at 146 Yonge Street. Bell advertised extensively in two local newspapers, with large display ads in The Globe (G) and small classified ads in the Toronto Daily Star (TDS). Much of Bell's activity in Toronto is gleaned from these two sources. Established in 1864 in Guelph, Ontario, the brothers Robert and William Bell initially used the upper story of a building on Wyndham Street and turned out one melodeon per week. Expansion of the business was immediate and rapid. In 1867, they moved to Carden Street and opened a new factory producing eighty instruments per year. By 1871, they opened a three-storey factory on Market Square. 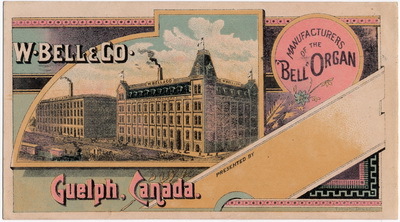 Ten years later, the Bell company had reputedly grown to become one of the largest and most prosperous businesses in the British Empire, with more than 500 employees and two huge, five-storey factories with an aggregate floor space equivalent to eleven acres, running twelve hours per day in order to supply the constantly-increasing demand and dominating the south end of downtown Guelph. The Grand Trunk Railway immediately adjoined the property, affording great facilities for transport. On the other side of the railroad tracks was a lumber yard with drying kilns and stables. Fifty different styles of instruments were made, varying from one valued at $50 to a large church pipe organ (G, Nov. 16, 1885). In 1934, the company declared bankruptcy and Bell's assets were acquired by Lesage Piano Ltée. of Ste Thérèse-de-Blainville, Québec, which perpetuated the Bell designs and name for several years. In its heyday, Bell claimed to be the largest maker of reed organs and pianos in Canada, boasting sales of 170,000 instruments by 1928. Bell's more elegant models, including its concert grand piano introduced in 1893, were supplied to Queen Victoria, the kings of Italy and Spain, the queen of the Netherlands, and a sultan of Turkey. Its organs and pianos routinely won awards in international trade exhibitions and competitions - silver medal for its cabinet organ no 2 in Philadelphia in 1876; gold medal in Sydney, Australia in 1880; gold medal in Jamaica in 1891; and awards in Paris in 1878, in London in 1886 and at the annual Toronto Industrial Exhibition. Branch agencies were established in neighbouring Ontario cities - Toronto, Hamilton, St. Thomas and London - as well as abroad - London, England in 1883, New Zealand in 1885, Sydney in 1887, and Port Elizabeth, South Africa in 1889. From its earliest days, Bell also carried pianos manufactured by the best American and Canadian companies. 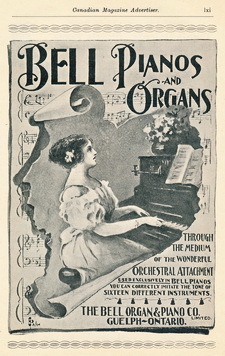 In 1888, Bell's London agency introduced the Bellolian, a push-up, self-playing attachment for reed organs and pianos using folded paper music. Referred to as a "piano player", this piece of furniture sat in front of the piano, its array of finger-like pads in the back resting on top of the piano or organ keys, and when not in use could be rolled to another part of the room. "This unique invention, with extraordinary musical capacity, is so simple that a child can play it" (G, Aug 10, 1901). A Bellolian piano player at the Guelph Civic Museum is an early model with a wooden, 65-note tracker bar, using a wind-up spring motor to power the music roll and foot-pedals to power the pneumatics operating its pads. 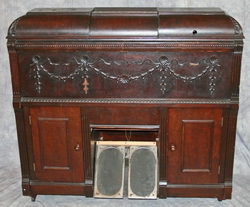 A later example, dated 1913, in the collection of Daniel Cox, Worrigee/Sydney, Australia, is identical in cabinet design, with applied wood decoration. The mechanism, however, had been updated with a brass, 88-note tracker bar, a tracking device to correct the roll and a chain that leads down to an air-motor, which operates both the music roll mechanism and the pneumatics that operate the keys, similar to a contemporary player piano. 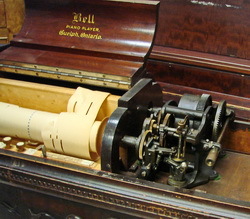 Simultaneously, Bell used the same name, Bellolian, for an automatic, self-playing reed organ. The company also manufactured and sold other types of mechanical music players and prominently advertised "Pianos, Organs and Automatic Instruments" on its invoices and letterhead. In 1897, Bell purchased the Canadian patents to, and marketed, the English Automatic Seraphone, a small mechanical reed organ playing 20-note paper rolls. "Experts for years have been endeavouring to discover some means of obtaining the pure wood-like tone (of the pipe organ) and at last it has been discovered. Owing to the extraordinary purity of the notes produced by this new invention, the appropriate name of Seraphone has been bestowed upon the wonderful contrivance which multiplies quality and power to such a surprising degree" (The Daily Mail and Empire, Sep. 8, 1897). Piano Co. Limited, Guelph, Ont. Stamped J.F. Dunn, Ridgeway, Ont. In 1895, the company acquired exclusive Canadian rights to the "orchestral attachment" by which, using added pedals, "you can in an instant transform the piano into the individual pieces of a whole orchestra" (G, Aug. 10, 1901). This invention consisted of a series of leather thongs or tongues with metal insides, which hung between the hammers and strings of the piano, and which, when operated by four pedals, produced at will representations of sixteen instruments - the harp, mandolin, banjo, zither, guitar, music box, chime of bells, bugle, autoharp, dulcimer, Handel's harpsichord, Bach's clavichord, Mozart's spinet, bagpipes and a fife and drum corps. An additional improvement was known as the silent "Practice Clavier", a detached keyboard which "saved the wear and tear of the action and did away with the disagreeable noise made by beginners" (G, Aug. 13, 1895). 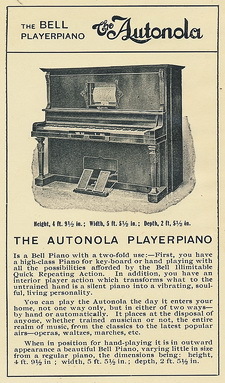 In 1906, Bell introduced a piano with a fully built-in mechanism, the 65-note Autonola, which it described as the first player piano in Canada. In 1909, it followed up with an 88-note model. 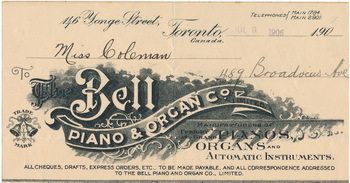 Bell claimed to carry the largest stock of player piano music in Toronto, over 3,000 selections. In June, 1908, it dispatched an Autonola to the Franco-British Exhibition, a large public fair held in London, England. While three other prominent piano manufacturers, Mason & Risch, Newcombe and R.S. 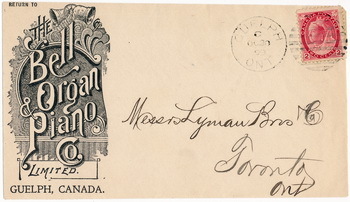 Williams, had been advertising showrooms in Toronto since late 1872 (G, Dec. 14, 1872), W. Bell & Co. began advertising its new Toronto warerooms, located at No. 12 King Street West, in 1887, selling American, Canadian and German pianos, all instruments guaranteed for six years (G, Mar. 5, 1887). In late 1887, "in a prominent and central position in the Main Building (of the Toronto Industrial Exhibition)", Bell advertised its new "mouse-proof attachment, so arranged that mice cannot get up into the interior of the instrument and destroy its action. This attachment is the exclusive property of W. Bell & Co." (G, Oct. 1, 1887). 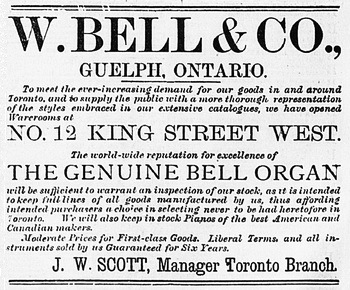 In 1892, now named the Bell Organ and Piano Co. Limited, it advertised its new Toronto warerooms at 70 King Street West (G, Sep. 7, 1892). The next year, Bell opened a second wareroom on the premises of Messrs. I. Suckling & Son's music store at 107 Yonge Street, below Adelaide Street (G, Sep. 28, 1893). It sold and rented pianos by leading American makers, including Decker Bros., Weber, Baus and Sohmer, all of New York, and Emerson, of Boston, as well as its "own unrivalled pure tone Bell pianos" (G, Nov. 8, 1893). In March, 1894, Bell issued a circular in which the company announced that "its office is now at 70 King Street West, the branch warerooms at 107 Yonge Street having been closed" (G, Mar. 21, 1894). The Bell company sponsored various musical entertainments including the, apparently famous, Wanderers' Bicycle Club. In September, 1898, while exhibiting its pianos in the Music Pavilion of the Toronto Exhibition, it held piano competitions and nightly recitals: "Last night the Bell Piano warerooms were crowded to suffocation with music lovers, eager to hear this great artist (Mr. T.W. Eckert of New York), whose playing was a marvel to all. His perfect imitations of 16 different instruments on the Bell orchestral piano was a feature which was heartily applauded by the immense audience present" (G, Sep. 3, 1898). In 1900, Bell announced that it had "obtained the sole right for Canada for the manufacture of the Apollo, a new automatic piano-playing instrument, which will be shown for the first time at the Company's exhibit at the Toronto Exhibition" (G, Aug. 25, 1900). The Apollo had a transposing keyboard, which allowed the music to be played in any key desired, plus a tempo device and an automatic rewind of the music roll. 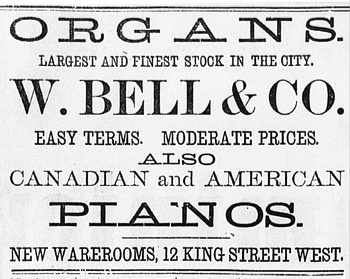 In December, 1900, Bell announced its move to its new Yonge Street warerooms after the first of the year: "The Bell Organ and Piano Company will occupy its handsome new warerooms, 146 Yonge Street, on January 15th. Meantime it is offering the most tempting bargains in organs and pianos at its present address, 70 King Street West. Open every evening this week for the convenience of customers" (G, Dec. 17, 1900). 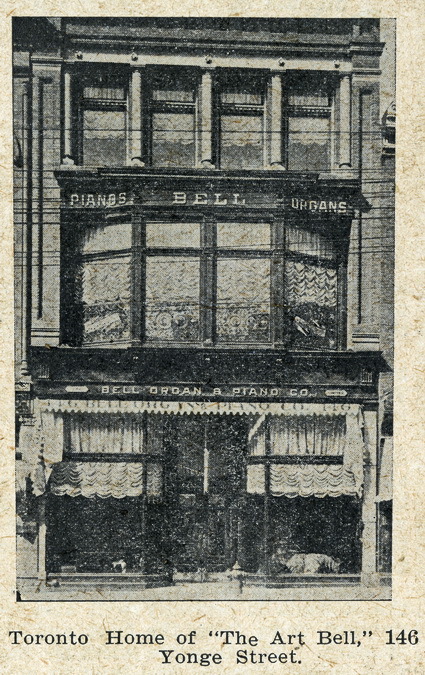 After move-in on the 15th, Bell offered special inducements to purchasers during alterations to the store, which proceeded for the next three months (G, Jan. 29, 1901). 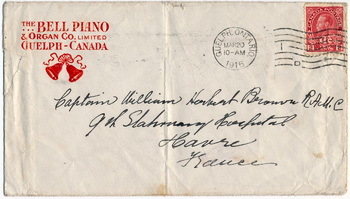 On April 13, the company announced a grand opening to the public, scheduled for April 18, "when the citizens are invited to pay its art rooms (referring to the new Art Design Bell piano) a visit and examine the triumphs of Canadian ingenuity and workmanship, which will be on view in the shape of a large collection of musical instruments, the product of the company's factory" (G, Apr. 13, 1901). Bell counted down the days to the grand event with daily ads for the "formal opening of our new suite of showrooms (which we are assured have neither counterpart nor superior)" (G, Apr. 17, 1901). Immediately after the momentous event, the following announcement appeared: "Last evening the invitation to visit our Palatial Music Rooms, at 146 Yonge Street, was responded to by over TEN THOUSAND MUSIC AND ART LOVING CITIZENS, WHO FULLY APPRECIATED THE HIGH IDEAL OF ART DISPLAYED IN THE DECORATION OF WHAT ARE NOW ACKNOWLEDGED TO BE THE FINEST AND MOST ARTISTIC MUSICAL SHOWROOMS ON THE CONTINENT OF AMERICA" (G, Apr. 20, 1901). By an amazing stroke of good fortune, we can judge for ourselves Bell's lavish self-praise of its new showrooms. Across the street from the Bell Warerooms, at 147 Yonge Street, one of Toronto's premier photographers, Alexander W. Galbraith, had just established his business, Galbraith Photo Company, in early 1901. 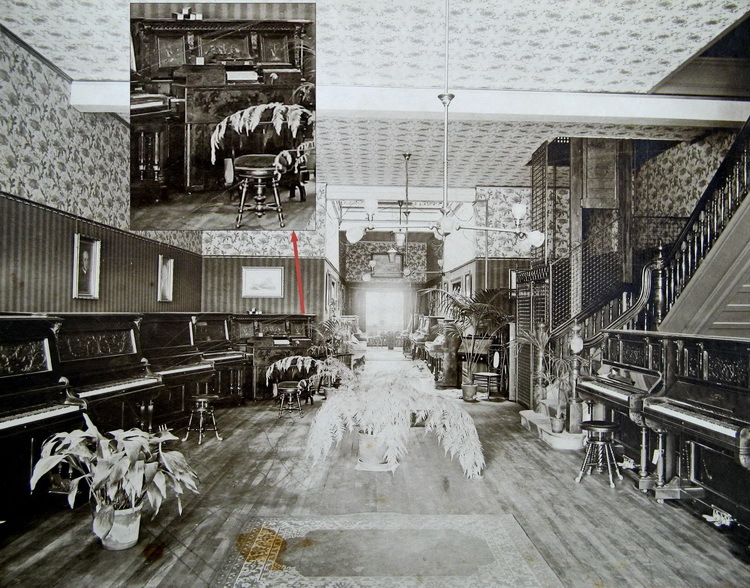 He took two interior and one exterior photographs of 146 Yonge Street which were published in The Globe newspaper in an article titled "Toronto Home of the 'Art Bell' Piano: An Ideal Setting for an Ideal Piano - Chastely Artistic and Richly Effective, the Establishment Commands Universal Admiration" (G, Aug. 10, 1901). The two Galbraith interior photographs are in the collection of the City of Toronto Archives. While the exterior view appears to be lost, that original Globe newspaper for August 10, 1901, resides in the Special Collections Department of the Toronto Reference Library. Photographs of Toronto by Galbraith Photo Co. Situated in the centre of the Toronto downtown business area, 146 Yonge Street, west side, between Richmond Street to the north and Temperance Street to the south, had a long history with many tenants. Its first advertisement in local newspapers was in 1855, "Bakery and Confectionary To Let" (G, Aug. 18, 1855). Clearly a successful ad, the City of Toronto Directory lists George Maver, Grocer and Confectioner, at the location in 1856 and 1857. The longest-term tenant, 1862-1890, was John Belton, leather merchant (shoes), who apparently also lived in the building at 146 1/2 Yonge Street. For part of the period, 1864-1867, the second floor was occupied by a photographic studio: "Great Attraction! 16 pictures for 25 cents! by Fenner's & Co's, 146 Yonge Street, Children taken as usual with every success" (G, Aug. 16, 1868). In 1890, the stock of "the well-known house of John Belton" was auctioned and the store put up for lease: "This is a rare chance for a man to continue a business where a fortune has already been made" (G, Jun. 2, 1890). Through the 1890s, it mostly operated as a clothing store under several names. In 1892, there was an unfortunate incident: "Mrs. Nesson, who was accidentally shot at 146 Yonge Street, over the Hand-in-Hand clothing store, is still living and will probably survive. Several doctors have been in attendance on her since last Friday night. On that evening she held a party, at the close of which she says that while handling a 38-calibre Smith & Wesson revolver she was accidentally wounded in the body just below the heart" (G, May 17, 1892). In 1894, the stock of that clothing store operator, Charles Lanning & Co., was put up for auction (G, Nov. 10, 1894) and the location was then occupied by Southcombe, "The People's Clothier, Hatter and Gents' Furnisher" (G, May 21, 1895). 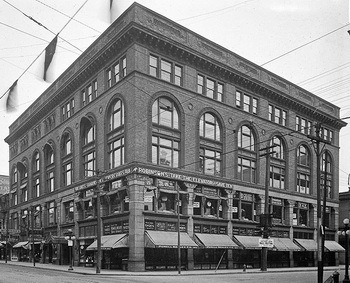 In 1899 and 1900, it was home to The Bazar Co., household furnishings. 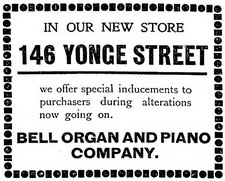 Finally, in 1901, 146 Yonge Street had its grandest moment to date with the opening of the Bell Piano Warerooms. "The Bell people appear to have followed up their triumph in piano-making with an equal triumph in wareroom setting and display. The large premises embraces three floors, two of which are devoted to a piano exhibit which is conceded to be unequalled in any of the great cities on this continent. On the third floor are the organ parlors, exquisitely equipped and fitted with the various types of the famous Bell organs. "Bell pianos of themselves make a striking picture, such is their chastely ornate style. They are happily termed "Art Bells" for artists have designed them and experts fashioned them. But seen amidst their luxurious and beautiful surroundings in the Toronto parlors, they appeal in the strongest possible way to highest artistic ideals - in short, no pen picture will suffice to do the display justice. It must be witnessed to be appreciated. "On entering the establishment one is deeply impressed at the very threshold for there is an air of massiveness and grandeur giving superb character to the place. The furnishings, rich and strong, are pleasingly relieved by luxuriant tropical foliage plants. But it is when one ascends on the elevator to the second floor that the full beauty of the premises dawns upon him. The visitor finds himself fairly transported with the view, not to say absolutely lost in wonder, love and praise" (G, Aug 10, 1901). Imagine the wonderful "Psyche" in Bell's ground-level window display. Note the words "Bell Pianos"
By the turn of the century, as the prominence of the piano as the primary instrument for home musical entertainment faced increasing challenge from the phonograph and the gramophone, piano manufacturers began to add talking machines to their product line. In late 1898, ads for the Berliner Gram-O-Phone began to appear in Toronto newspapers. The local agent was the Nordheimer Piano & Music Co. Limited, located at 15 King Street East. Also in 1898, R.S. Williams and Sons Co. Ltd, located at 143-145 Yonge Street, became the Canadian distributor of Edison phonograph products. 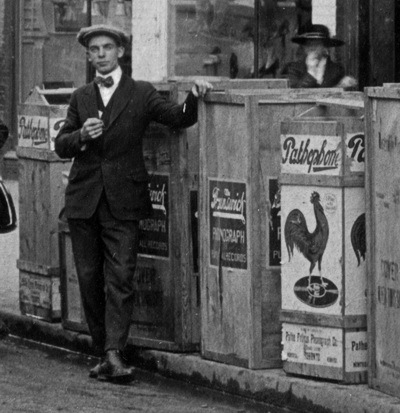 in front of Chapple's music store, Galt, Ontario, ca 1917.
named after John Galt who founded the town of Guelph in 1827. In May, 1908, a notice in Musical Canada announced that "before long a Talking Machine Department will be installed on the ground floor of the Bell Piano warerooms on Yonge Street. Manager George P. Sharkey stated that he had the matter under consideration but would not say definitely whether talking machines would be introduced or not. He stated that his company had received propositions from different manufacturers and that probably one of them would be accepted". He also reported "a demand from Muskoka and other summer resort residents for the little folding Bell organ that can be carried in one hand after it has been folded up like a valise. They are a great aid in missionary work, and they are especially adapted to boats and small launches" (Musical Canada, Volume III, May 1908 - April 1909). 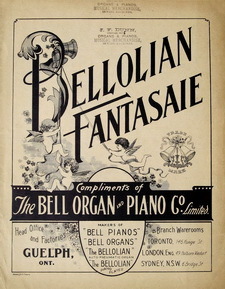 The August 1908 issue of Musical Canada cleared up the mystery of Bell's cautious May announcement: "The Bell Piano Company is making extensive alterations to the ground floor of its Toronto warerooms to accommodate the large shipment of the celebrated 'Pathéphone', the wonderful new French talking machines, which are played with the aid of sapphires instead of the old style needle. It is claimed for these machines that they entirely obviate the "scratching" produced by needle-played machines. Double-sided flat discs are used (two records to each disc) and the records will be extensively stocked by the Bell Company". In March, 1909, Musical Canada announced that, in addition to the Pathé product, Bell would also be handling "extensively the celebrated Clarion talking machine and needle records, the Apollo hornless machine and the Pollock hornless cabinet machines". 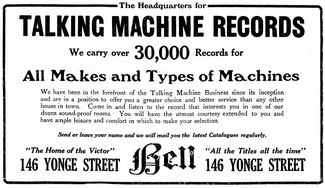 Bell advertised Pathé records in June and July, 1909: "We have now in stock over two thousand of the celebrated Pathé Talking Machine Records, the finest in the world. They play with a sapphire point, no needles to change, no scratch, and they do not wear out. Come in at any time and hear them in our new Talking Machine Department. 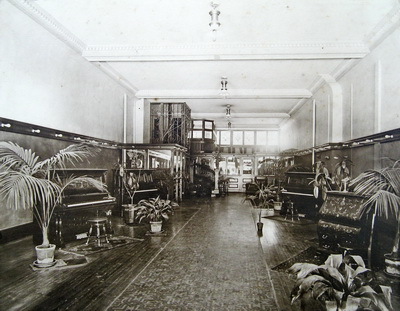 Bell Piano Warerooms. 146 Yonge Street" (TDS, Jun. 25, 1909). Its July ad described its company as the "sole agency" for Pathé records (TDS, Jul. 29, 1909). After repeated announcements through autumn, 1908, that "a large consignment of the celebrated 'Pathéphone' talking machines is on its way from London, England, consigned to the Bell Piano Warerooms" and that "the Bell Company is going to handle these up-to-date machines on a large scale" (Musical Canada, Volume III, May 1908 - April 1909), I have been unable to locate a single Bell ad for the Pathéphone (or the Clarion, Apollo or Pollock machines). Clearly, Bell chose not to advertise these products because they were not huge money-makers for them. The first ads for the Pathéphone appear in Toronto newspapers only in 1914. The distributor is Glendon's located in the New Ryrie Building, 229 Yonge Street at Shuter. We will encounter this address again. booking agency for high-end musical entertainment. E. Berliner, affiliated with the Victor Talking Machine Company in Camden, New Jersey, advertised extensively in Toronto newspapers, selling "Berliner Gram-O-Phones or Victor Talking Machines". In autumn, 1902, along with Nordheimer, its products were also carried by Thomas Claxton, 197 Yonge Street; in 1904, by Toronto Gramophone Co., 48 Queen St. W., and T.E. Longhurst, 171 Queen St. E.; in 1906, by R.S. Williams & Co. Ltd, 143 Yonge Street (directly across the street from Bell) and Gourlay, Winter & Leeming, 188 Yonge Street; and sold in its own store, His Master's Voice Gramophone Co., 286 Yonge Street. Bell began carrying Berliner (Victor) products by 1909. 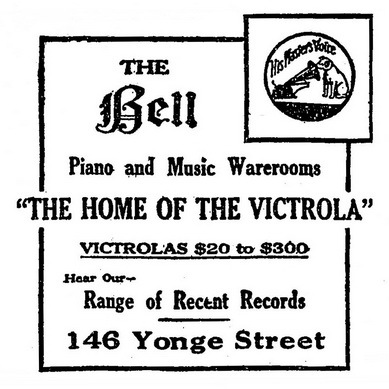 The first notice of a "gramophone" department at the Bell Piano Warerooms, carrying Victor records and machines, was an ad which appeared on September 1, 1910, where Bell is described as having "the largest stock in the city" (G, Sep. 1, 1910). Rival piano manufacturers followed soon after: Mason & Risch Limited, 230 Yonge Street, described as the "largest Victor distributors in Canada", Heintzman and Company, 193-197 Yonge Street, and even the T. Eaton Company Limited department store. All of these businesses were within several blocks of each other and it is magical to imagine visiting each shop, in succession, about 1911, comparing features and prices, and then striking a deal on the very latest Victor gramophone. In February, 1910, we meet, for the first time, Harry E. Wimperley (sometimes spelled Wimperly), who will play a crucial role in the chronology of the Bell Piano and Music Warerooms in Toronto. An interview in the social section of Musical Canada records: "I had a long talk with Mr. H. E. Wimperley, who is now in charge of the store and show rooms of the Bell Piano and Organ Company, on Yonge Street. Mr. Wimperley has been in Pittsburgh for eighteen months, and, in the course of conversation, he more than once expressed his surprise at the marked advances in trade conditions since he was last doing business in Toronto. 'You can say,' declared Mr. Wimperley, 'that business with the Bell Company is in first-class shape, and money is coming in well'" (Musical Canada, Volume IV, May 1909 - April 1910). In November, he states: "The trade in 'singing' machines is ... very active ... and the prospects excellent" (Musical Canada, Volume V, May 1910 - April 1911). 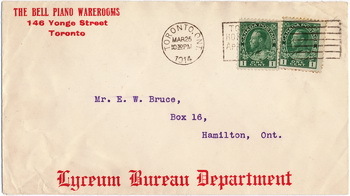 Mindful of Bell's central location on Yonge Street, Wimperley opened a bureau for the sale of concert and theatre tickets, The Bell Ticket Bureau. It saved its patrons much loss of time which would result had they to go to the Royal Alexandra, the Foresters' Hall, the Conservatory of Music, Massey Hall, etc., to purchase tickets. By the fall of 1911, The Bell Piano and Organ Company increased its product line to include Edison phonographs and was listed in an Edison ad as an official Toronto distributor (G, Oct. 28, 1911). Bell also carried several makes of player piano, a large stock of player rolls "for rental and library exchange services", "a few slightly used (talking) machines of various makes at bargain prices" which it had likely taken in as trade on a new piano or gramophone, musical instruments including "violins, banjos, guitars, mandolins, flutes, harmonicas and all sorts of musical and band instruments, parts and equipment" and sheet music on sale at 11 cents for popular music and 25 cents for operatic numbers (G, Nov. 11, 1911). Several Victor dealers, including Mason & Risch Limited in its newspaper display ad for April 6, 1912, described their firm as "The Home of the Victrola". Bell used this catchphrase extensively in its advertising in 1913. The handsome E.L. Ruddy billboard, illustrated at the beginning of this article, shows a Bell salesman at Bell's, 146 Yonge Street, "The Home of the Victrola", demonstrating a top-of-the-line Victrola to a nattily-dressed young couple. 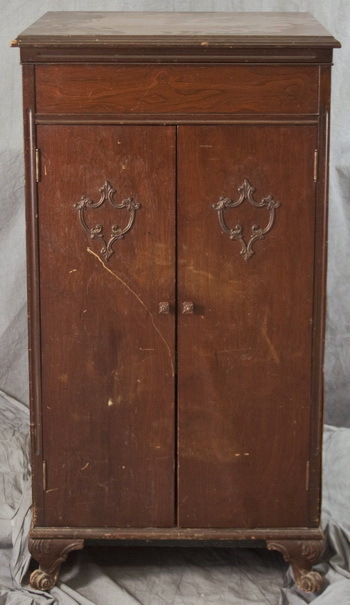 The upright cabinet models depicted in the drawing are close approximations to actual models, but the artist has taken liberties with some of the details. The original location of a second E.L. Ruddy billboard, advertising "Victor Records at Bell's (The Bell Piano & Music Warerooms)", can be ascertained precisely, to the south and just around the corner from The Strand Theatre, which was rebuilt in 1911 from the original Shea's Theatre, at 91-93 Yonge Street, east side. To commemorate in a tangible way our 50th anniversary we are making a gift of a handsome music cabinet in walnut or mahogany, value $15, to everyone who buys a piano or player-piano at this sale, or one of our combination duet benches with convenient compartment for the orderly keeping of music" (G, Feb. 13, 1915). In March, 1915, there was an ominous notice in The Globe, defending its piano sale and suggesting that Bell's stellar situation as a piano manufacturer and retailer was, perhaps, not all that it seemed. "A talk with Mr. Wimperley, Manager of the Toronto branch of the Bell Piano Company, made it clear that there was nothing surprising in the circumstances connected with the great sale which started today. For the past six months the Company has made the most strenuous efforts to keep the factory running regularly in order to retain as many of the employees as possible during the quiet times that have prevailed, but are rapidly passing. It is felt by Mr. Wimperley that the time is ripe for moving the hundreds of instruments that have been built in excess of orders, and he considers that the wonderful inducements offered should easily accomplish this aim" (G, Mar 30, 1915). 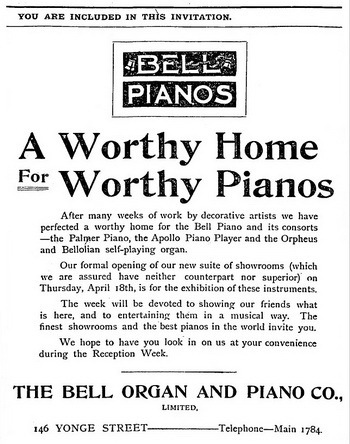 By April, Bell was promoting its "Factory Over-Production Piano Sale" (G, Apr. 7, 1915). In November, it announced its "Piano Removal Sale ... Circumstances directly created by the reorganization of this Company involve vacation of premises at 146 Yonge street to occupy a new and particularly advantageous location. This removal entails the immediate disposal of hundreds of instruments now in our showrooms and warehouse" (G, Nov. 17, 1915). On December 15, Bell advertised the "last few days!" of its "closing sale" ... "Retiring from Retail" (G, Dec. 15, 1915). Six days later, it advertised "FINAL 3 DAYS LEFT!" (G, Dec. 21, 1915). The Bell Warerooms at 146 Yonge Street closed on December 24, 1915. The Berliner Gram-O-Phone Co. Limited, stopped listing Bell as one of its Toronto dealers on December 23. Bell never again appeared in an ad for Victor gramophones. 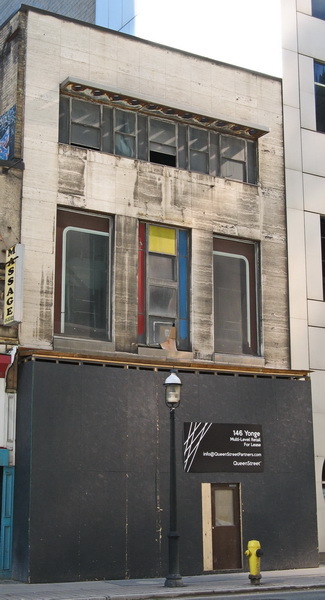 146 Yonge Street continued to be the temporary home for a succession of businesses. 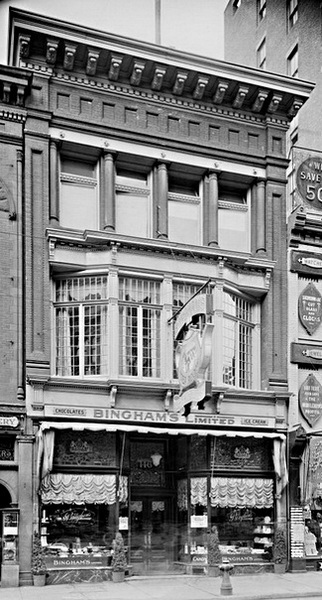 Bingham's Pharmacy, Confectionary and Tea Room moved in on July 14, 1916 and occupied the building until the early 1930s when it reverted to a clothing store. Fashion Craft Shops Limited announced that it was opening soon at 146 Yonge Street in a large Globe display ad for Aug. 19, 1933. By 1940, it had become the home of Gordon Dunfield Limited. "If your clothing is purchased at Gordon Dunfield's, Fashion-Craft is your tailor, and our label is your guarantee of quality, styling and tailoring that is unsurpassed" (G, Feb. 26, 1940). On February 25, 1948, Virginia Dare Dresses announced in The Globe a "Before-We-Move" sale from its current location at 148 Yonge Street to its new home at 146 Yonge Street. It occupied the location through 1956. From 1957 to 1972, it was a Honey Dew Coffee Shop, shared for part of the time with a cricket, social and service organization, the Royal Overseas League (G, Jul. 10, 1962), and a dance hall sponsored by the Yonge St. Glee Club (TDS, Nov. 29, 1968). In the 1970s, Clark Shoes Ltd. set up shop on the ground floor and Sarks Kibalian Photo Studio operated on the 2nd floor. In 1982, it once again became a clothing store, Moore's "The Suit People - Clothing for Men" (TDS, May 5, 1982). Most recently, and ignominiously, it was home to Discount King and Urban Sense. Many tenants over more than 150 years. 146 Yonge Street still exists; however, photographs taken during construction of the Toronto subway under Yonge Street show that its magnificent mid-Victorian facade had already been removed by 1950. Currently, the building is all but abandoned. The lower floor is boarded up with a sign "Multi-Level Retail For Lease", ironically, just as it was in its first advertisement in 1855.
with the arched windows, Room 420. The intersection of Yonge and King Streets has long been the heart of Toronto's business and financial district, so it is not surprising that Bell's earlier locations have all disappeared. 12 and 70 King Street West are both occupied by giant bank towers, including Canada's tallest skyscraper, First Canadian Place, the headquarters of the Bank of Montreal. 107 Yonge Street, around the corner, is home to another financial institution, the Dynamic Funds Tower. From 1911 to 1915, the City of Toronto Directories list Harry E. Wimperley as the manager of the Bell Piano and Organ Company, with his residence as 285 Ossington Ave, Toronto. From 1916 to 1921, his listing changes to "Pianos, res Oakville, Ontario". There is no listing for 1922 and following years. The "particularly advantageous location", mentioned in Bell's November 1915 notice in The Globe, turned out to be the New Ryrie Building at Yonge and Shuter Streets, then still occupied by Glendon's, "the largest Pathé dealer in Toronto". Wimperley advertised his upstairs (4th floor) salesrooms in the building for the first time in March, 1916 (TDS, Mar. 24, 1916). The next month, 420 Ryrie Building is advertised as "The new home of the Bell Piano" (G, Apr. 5, 1916). A man of seemingly infinite patience, Harry, for the next five years, ran five tiny and increasingly desperate ads, repeated weekly, in the "Articles For Sale" classified section of the Toronto Daily Star or the "Musical" classified section of The Globe. Gone were the large display ads. Four of his ads were for pianos; one was for talking machines. The citation for each ad includes the date of its initial newspaper appearance. One sad event may explain, in part, Wimperley's disinclination to take a stronger initiative in clearing out Bell's Toronto stock. An article in the December 12, 1916, edition of the Toronto Daily Star reported: "For thirty hours Lieut. C. G. Wimperly, son of H. E. Wimperly of Oakville, lay on the battlefield after he sustained shrapnel wounds on many parts of his body during the attack on the Regina trench ... Lieut. Wimperly is in the 4th Canadian General Hospital, London". The final ad, "A FEW slightly used Bell upright and player pianos ...", appeared for the last time on March 1, 1921. 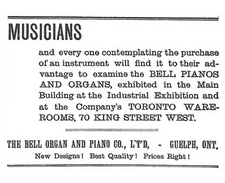 Although the Bell Piano and Organ Company continued to thrive for several more years - it introduced its new reproducing piano to great excitement at the Canadian National Exhibition in Toronto in 1923 (Canadian Music Trades Journal, September 1923) - and Bell pianos continued to be sold and rented by local piano dealers, this marked the end of the Bell warerooms in Toronto. In April, 1917, Mason & Risch was named exclusive agent of Bell Pianos in Toronto (G, Apr. 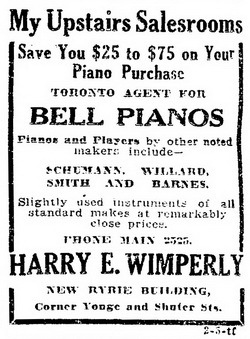 30, 1917) and by 1924, R. F. Wilks & Co., The Uptown Piano House (834 Yonge Street), described itself as the "exclusive Toronto agent for Bell pianos and organs" (G, Oct. 8, 1924). 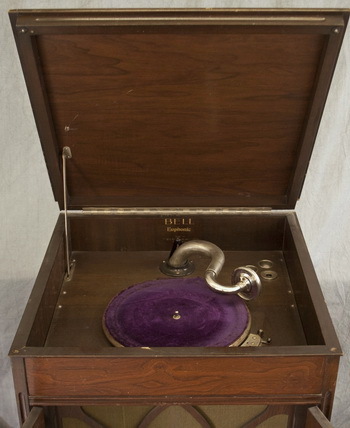 An interesting recent posting on Kijiji, an on-line classified advertising service, was a flat top, console-styled gramophone and record cabinet, typical of the period 1923-1924, labelled "THE BELLOLIAN, MFD BY THE BELL PIANO & ORGAN CO. LTD. GUELPH .... ONTARIO". Unfortunately, the gramophone mechanism had been removed, so it was not possible to determine the company of manufacture. 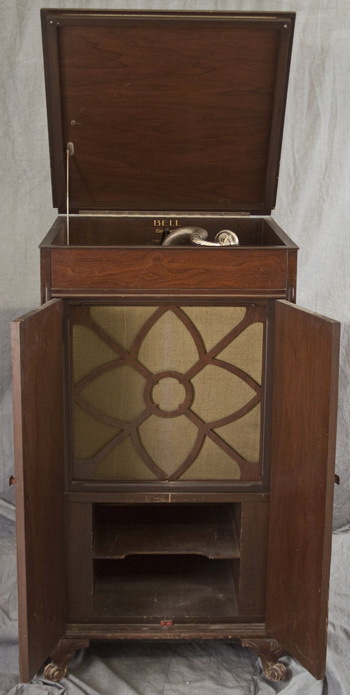 Was this an early attempt by Bell to manufacture its own talking machine, using the name of its 1888 push-up piano player, or was the gramophone generic and the label simply describing the cabinet? An article titled "The Story of the Bells" from the Guelph Evening Mercury and Advertiser, issue of July 20, 1927, page 25, reads: "Some two or three years ago they (Bell) introduced a Phonograph of their own make, and at the present time have in process of manufacture a new type of instrument of this class, which is destined to attain similar fame to their celebrated Pianos and Organs". Histories of the Bell company mention its manufacture of a gramophone about 1925. 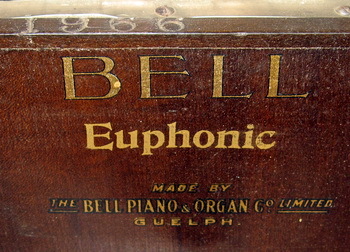 Housed in the Guelph Civic Museum, in the city of its manufacture, is an upright, cabinet model, orthophonic-style gramophone labelled "Bell Euphonic Made by the Bell Piano and Organ Co. Limited Guelph" with serial number 1966. 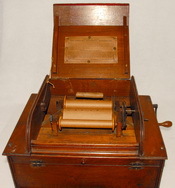 The orthophonic-type sound box, with a black, metal grille, has no distinguishing maker's name. A search through contemporary Guelph and Toronto newspapers and Guelph City Directories failed to turn up a single reference or advertisement for this machine. A canvas of local collections failed to uncover another example. I would be grateful to our readers for any information about any Bell-branded talking machine or related advertising material. Clearly short-lived and not widely distributed, the elusive Bell Euphonic did not leave a legacy similar to Bell's extraordinary pianos and organs, but rather quietly disappeared from talking machine history leaving few examples in its wake. Special thanks for invaluable assistance in the research and writing of this article to John Huzil, City of Toronto Archives; Alan Walker, Special Collections Department, Toronto Reference Library; Lindsay Woelfle, Guelph Civic Museum; Darcy Hiltz, Guelph Public Library; Daniel Cox, Worrigee/Sydney, Australia; Arthur E. Zimmerman; and Betty Minaker Pratt.